As a research project I have developed an itinerary service. The idea started when I was doing a hackathon with colleagues for the city of Amsterdam (see earlier post). I wanted to recommend an itinerary to a tourist visiting the city of Amsterdam. Furthermore, I wanted to make the itinerary based on the user’s interests to recommend interesting places and activities for him in the city. If the user is interested in modern art for example, the recommendation scores for modern art museums will increase for that user. The tool divides the duration of the tourist’s stay into separate time slots. For example, a single day could be divided in 3 time slots: morning, afternoon, evening. POIs get a different recommendation score for each time slot they can be visited. The Vondelpark for example could be less recommended on Monday morning because of expected rain or because of expected crowds. On Tuesday morning the Vondelpark could be recommended because of an interesting event or nice weather. The itinerary tool will try to limit travel time between the recommended POIs (point of interests). In this way the tourist will not waste time on travailing. The user can also set a budget for the entire itinerary. By taking all these considerations into account the tool should be able to aid the user in making good decisions about which places to visit and when to visit them. In this blog I’m going to explain the techniques used in making the itinerary planning algorithm. The calculation of the recommendation scores for the POIs is handled by another system (a recommendation engine) and is not described in this blog. When creating an itinerary (or for that matter any kind of optimised planning) where you have a lot of possible solutions, you quickly run into the situation that you can’t find an the perfect solution by trying all combinations. The amount of feasible combinations you have in making the itinerary practically rules out the possibility to try out all combinations to find an optimised one. 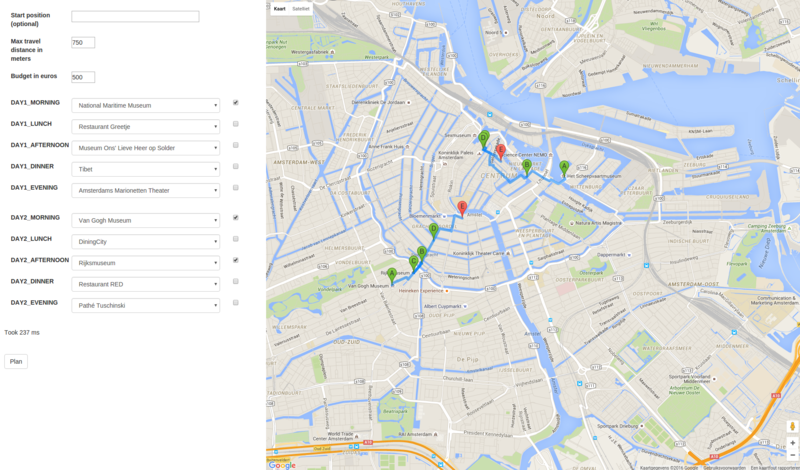 Let’s say we want to plan a trip where we visit 6 POIs in the city of Amsterdam in succession. 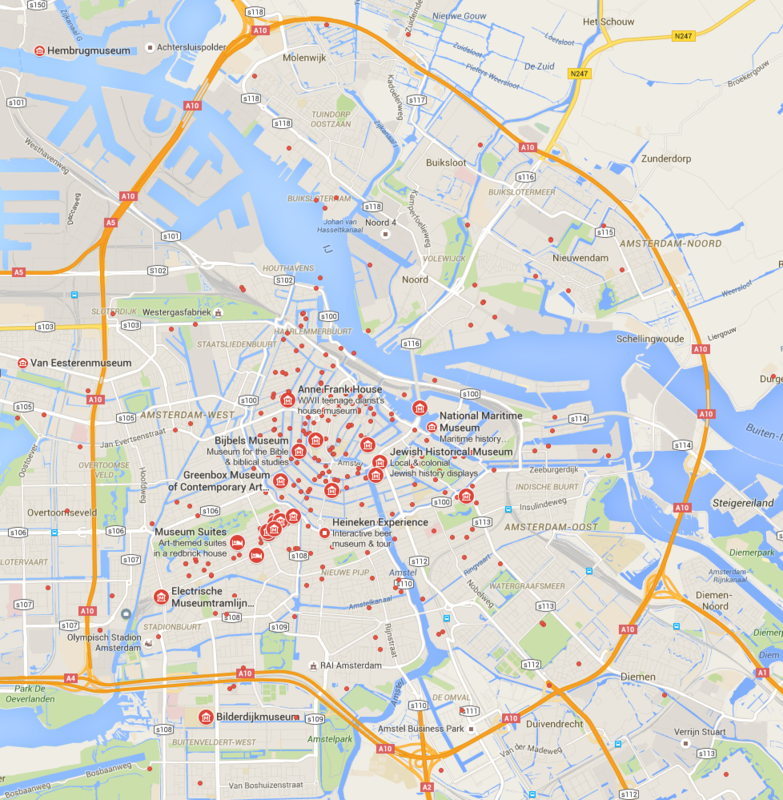 A quick look on Google maps shows you how many POIs are in the city of Amsterdam. 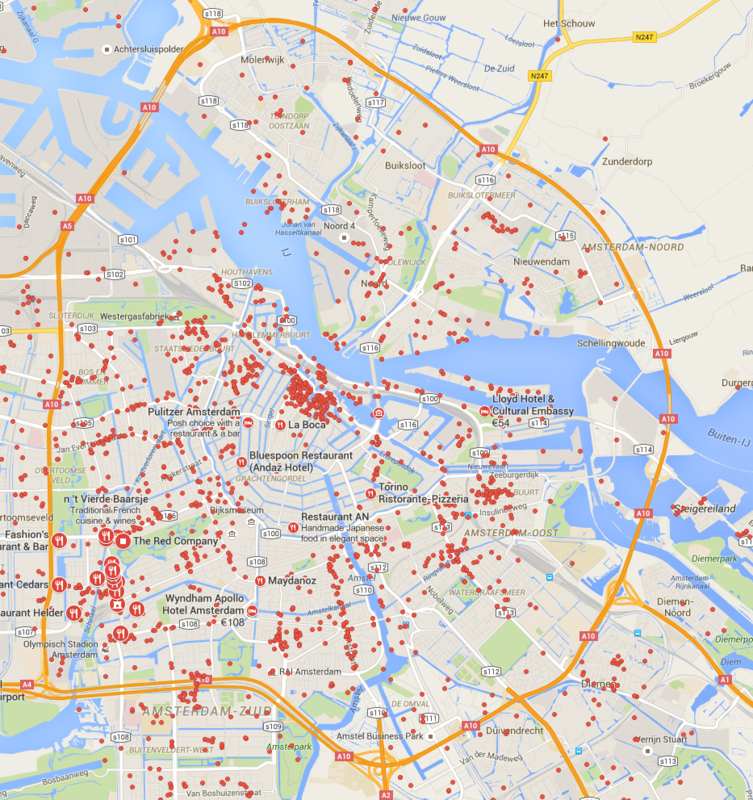 Let’s say there are about a 1,000 POIs in the city of Amsterdam. If you’d want to try out all combinations to find the most optimum itinerary for 6 time slots you get the following amount of combinations: 1,000 * 1,000 * 1,000 * 1,000 * 1,000 * 1,000 = 1,000,000,000,000,000,000. Remember that the order in which you visit the POIs does matter, as each combination of a time slot and a POI has it’s own recommendation score. For simplicity I don’t take into account that you may not want to visit the same POI twice, this would slightly reduce the amount of permutations. If you can make an implementation that can check 100,000 combinations per second, it will take you about 300,000 years to try out all combinations. I doubt that the city of Amsterdam will still have the same tourist attractions in the amount of time it takes to find the most optimum itinerary. Here is an example of how we can solve this by trying all combinations. On my machine this calculation will take about 3000 years, which is not very practical. The example given was actually still a simple one, probably there are some shortcuts imaginable. However, one of the features in the actual planning algorithm is that it also takes into account the distance between each POI to make sure you don’t travel too much between them. Furthermore, there is also a constraint that takes the costs of the POIs into account. In this way a user can set a budget for his trip. These features add more complexity which makes the brute force attempt even more unfeasible because optimizations, or shortcuts within the brute force program become much harder. Let’s see if we can find a better solution which can solve the problem in near real time. Luckily there are techniques specialised in solving these kinds of optimization problems. One of these techniques is ILP (Integer Linear Programming). With ILP you write the problem in a mathematical form and let an algorithm (also called a solver) come up with an optimised solution. The mathematical form contains constraints that specify the desired properties of the solution. Linear programming has been around for a long time. According to wikipedia linear programming was already being researched in the 1940s. Optimization is central to any problem involving decision making. 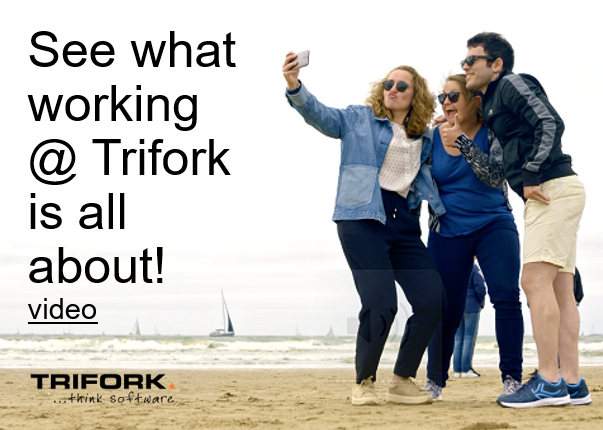 It’s found to be useful in a lot of different problem domains in economics, engineering like production planning, scheduling, transportation planning, telecommunications networks and cellular networks. The linear function of the itinerary planning, also called the objective function, contains a variable for each of the poi’s for each time slot. For example, if we want to plan a trip where we have two possible POIs and two time slots we have 4 combinations possible in making the itinerary, 2 time slots times 2 POIs. We define a variable for the Rijksmuseum in the morning and one for the Rijksmuseum on in the afternoon. So the algorithm is trying to tell us that in order for the most optimum day you have to go infinite times to the Rijksmuseum in the morning, an infinite times to the Rijksmuseum in the afternoon, an infinite times to the van Gogh museum in the morning and an infinite times to the van Gogh museum in the afternoon. This maximizes the output of the objective function. Not very practical to visit a museum infinite times, is it? Let’s try adding some constraints. Let’s first add a constraint for each museum per time slot so that you can only go once to every museum per time slot. Here is the constraint that limits variable a, the Rijksmuseum in the morning, to be either 0 (don’t visit) or 1 (visit). A constraint is basically a row of multipliers combined with an operator and a value. This constraint is met if the sum of the variables combined with the multipliers plus the offset is lower or equal to 1. 0 is smaller than 1 so the constraint is met. 1 is equal to 1 so the constraint is met. 2 is larger than 1. The algorithm cannot pick a number larger than 1 for variable a.
Constraint 1 limits the value of a to be either 1 or 0. Constraint 2 limits the value of b to be either 1 or 0 etc.. The algorithm picks the value 1 for variable a, b, c and d. We see that the most optimum (maximal) outcome is 25. The Rijksmuseum in the afternoon (b) is recommended more than the Rijksmuseum in the morning (a). The van Gogh museum is equally recommended in the morning as in the afternoon. So the optimum solution (maximizing the outcome of the objective function) given all the constraints is to chose the van Gogh museum in the morning and the Rijksmuseum in the afternoon. Google open sourced a library with optimization algorithms that I use in this example. It can be found at https://developers.google.com/optimization/?hl=en. The OR tools solver let’s you immediately set a minimum and a maximum for a variable, it wouldn’t surprise me if this was implemented by just adding a constraint for each variable as explained earlier. I’ve also created an implementation of the 1000 POIs in 6 time slots which is a bit more complex but is just an expansion of the previous example but with more variables. You can find the code in LargeItineraryILP.java. On my machine this calculation takes about 150 milliseconds. Which is a whole lot better than the brute force attempt. With ILP it’s a lot easier to solve certain kinds of problems that can’t be easily solved using traditional procedural styles of programming. The nice thing about these algorithms is if you know how to specify the problem, the constraints and the objective function, a complex algorithm will find the answer for you without it being necessary that you understand the algorithm itself. Google’s OR tools library contains several implementations of these algorithms. It’s possible to switch the implementation of the solver without changing the specification of the objective function or the constraints. Basically you’re programming what to output of the program should be, instead of programming how to get there. Thanks … good and clear explanation of a difficult problem.